BALTIMORE ( Stockpickr) -- There's no question about it -- U.S. markets have been the place to be in 2014. In fact, U.S. stock indices are one of the few country groups that are predominantly up year to date. So, owning U.S. equities hasn't just been your best bet, it's also been one of the few bets that haven't lost money in 2014. But as the year draws to a close, some non-U.S. stocks are showing signs of a strong rebound, and more importantly, you can actually buy them on a U.S. stock exchange. That's because it's primarily the large-cap international stocks that are dual-listed in the U.S. and that are hitting bottoms right now. After all, with a strong dollar in play this fall, any names that have big dollar earnings and report their financials in foreign currencies are thriving. The good news is that you don't need to guess at which foreign stocks you should actually buy this week -- today, we're taking a technical look at five breakout buys in overseas stocks. Up first is Dutch and UK-based oil giant Royal Dutch Shell ( (RDS.B - Get Report) ), a name that's had the bearish double whammy of being a foreign stock and being an oil stock. Neither of those categories has fared particularly well in recent months -- Shell is down 18% since July. But long-suffering shareholders could be in store for some upside from here; Shell is starting to show signs of a bottom. Shell is currently forming an ascending triangle bottom, a bullish price setup that's formed by horizontal resistance above shares (in this case at $74), and uptrending support to the downside. Basically, as Shell bounces in between those two technically-significant price levels, it's getting squeezed closer to a breakout above support. When that happens, we've got our buy signal in this oil and gas stock. Momentum, measured by 14-day RSI, adds some extra confidence to upside in RDS.B. That's because our momentum gauge has been making higher lows since Shell bottomed in October, an indication that buying pressure is starting to build in shares. 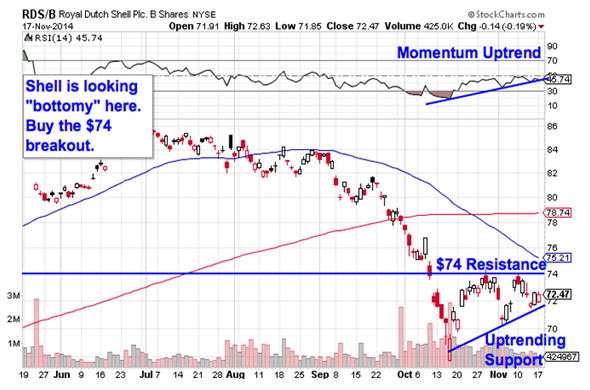 Since momentum is a leading indicator of price, that uptrend in RSI is good news for Shell. Still, it's critical to wait for RDS.B to catch a bid above $74 before you put money on this trade. Chipmaker Taiwan Semiconductor Manufacturing Co. (TSM - Get Report) is actually having a strong year in 2014: since the calendar flipped to January, this $114 billion tech stock has rallied more than 25%, more than doubling the broad market. But TSM could be in store for a second leg higher here -- the breakout level to watch in TSM is $22.50. TSM is currently forming a rectangle pattern, a consolidation setup that's formed by a pair of parallel trendlines that basically "box in" shares (that's how the pattern gets its name). Even though TSM has been range-bound since May, it's that well-defined sideways churn that actually makes this stock tradable here. If shares can catch a bid above $22.50, then we've got a high-probability buy signal here. Why all of that significance at that $22.50 level? It all comes down to buyers and sellers. Price patterns like the rectangle are a good quick way to identify what's going on in the price action, but they're not the actual reason a stock is tradable. Instead, the "why" comes down to basic supply and demand for TSM's stock. The $22.50 resistance level was a price where there has been an excess of supply of shares; in other words, it's a spot where sellers have previously been more eager to step in and take gains than buyers have been to buy. That's what makes a breakout above $22.50 so significant -- the move means that buyers are finally strong enough to absorb all of the excess supply above that price level. 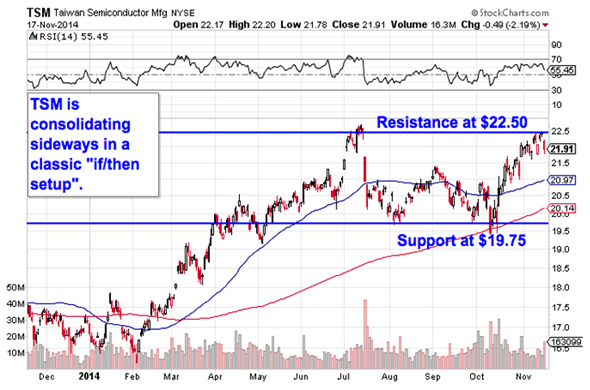 Our resistance level is getting tested this week -- wait for the breakout before you buy it. We've got the exact same setup in play in shares of Peruvian banking stock Credicorp (BAP - Get Report) . The only difference is that the breakout has already happened from BAP's rectangle with a move through former resistance at $169. Don't worry if you missed the move, though. A "throwback" is giving traders a second chance at a low-risk entry in BAP. A throwback happens when a stock breaks out, and then moves back down to test newfound support at that former price ceiling level -- in this case at $169. And while throwbacks look ominous, they’re actually constructive for stock prices because they re-verify the stock’s ability to catch a bid at support. For that reason, it’s best to think of a throwback as a buying opportunity in BAP. So, from here, it makes sense to buy the next bounce off of that $169 level. Relative strength is the side-indicator that adds confidence to the BAP trade. This stock's relative strength line has held its uptrend since shares entered their rectangle in April, an indication that BAP is outperforming the rest of the market in good times and bad ones. 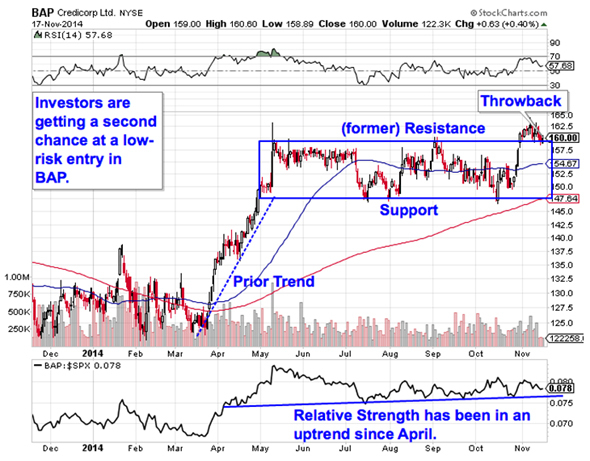 As long as that relative strength uptrend remains intact, shares of Credicorp should keep outperforming. It doesn't take an expert technical analyst to see that shares of UK-based cellular carrier Vodafone (VOD have been looking horrendous for most of 2014. VOD has bounced its way lower in a very textbook downtrending channel for most of the year, dropping 24% between January's highs and October's lows. But as the broad market bounced in the second half of October, VOD has been bouncing a lot harder -- hard enough, in fact, to break the downtrend that's hammered shares lower all year long. 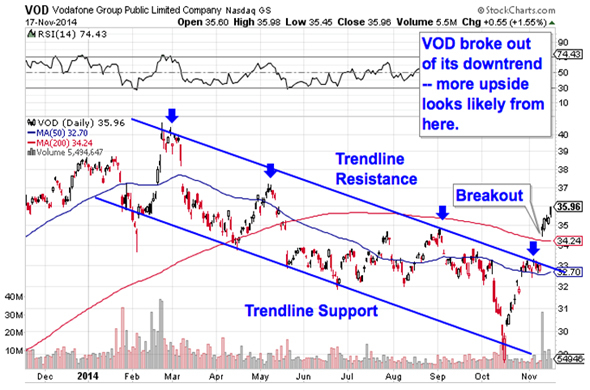 That broken downtrend is a bullish signal for VOD as we head towards 2015. Vodafone's next potential resistance level comes in at $37, the price ceiling that was last (unsuccessfully) tested back in May -- but that $37 level is a fairly weak ceiling, and once it's breached, it clears the way for a re-test of the highs shares made at the start of the year. For trader who aren't risk-averse, it makes sense to scale into a position here. The 50-day moving average has been a pretty good proxy for the trend in VOD. That makes it a logical place to park a protective stop below. Last up on our list of foreign breakout trades is Diageo plc (DEO - Get Report) , the $75 billion international liquor maker. DEO has seen pretty choppy trading all year long, churning sideways for most of the year before starting to show signs of a bottom. The classic reversal pattern in DEO is still in the early stages this month, but a breakout above $119 is a pretty clear-cut buy signal from here. DEO is currently forming an inverse head and shoulders pattern, a bullish reversal setup that indicates exhaustion among sellers. 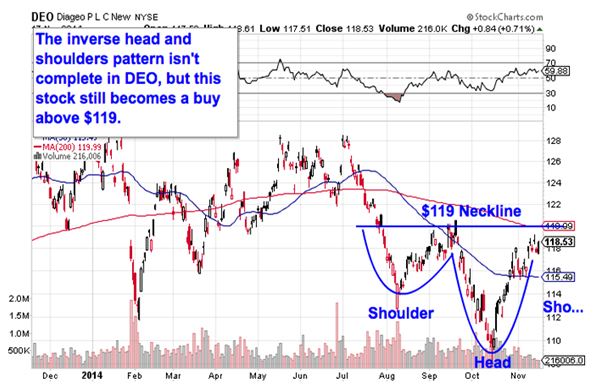 You can spot the inverse head and shoulders by looking for two swing lows that bottom out around the same level (the shoulders), separated by a bigger trough called the head; the buy signal comes on the breakout above the pattern’s “neckline” level (that's the $119 price level I mentioned in DEO). Don't get thrown off by the abundance of gaps on Diageo's chart right now. Those gaps, called suspension gaps, are caused by overnight trading on the London and Irish Stock Exchanges. They can be ignored for trading purposes. To see this week’s trades in action, check out the Technical Setups for the Week portfolio on Stockpickr. At the time of publication, author had no positions in the names mentioned. Jonas Elmerraji, CMT, is a senior market analyst at Agora Financial in Baltimore and a contributor to TheStreet. Before that, he managed a portfolio of stocks for an investment advisory that returned 15% in 2008. He has been featured in Forbes , Investor's Business Daily, and on CNBC.com. Jonas holds a degree in financial economics from UMBC and the Chartered Market Technician designation.